Neutered female, born on January the 18th 2006. Colour blue tortie (EUR g). Breeder Lea Pessi. Helmi lives in the FIN*Lumihelmen cattery. Helmi is a happy mother of FIN*Kassilan E-litter (where our Emma also belongs to). The sire is IDP*Wave's Kappa A Zan Magic Pocemon (EUR ds). 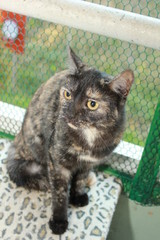 Helmi is an extremely beautiful and charming female European with a good blue tortie colouring. Her name means a pearl. Helmi is a delicate, considerate and playful cat. Cooperation of intelligence and action enables her to open closed doors and get where she wants to. 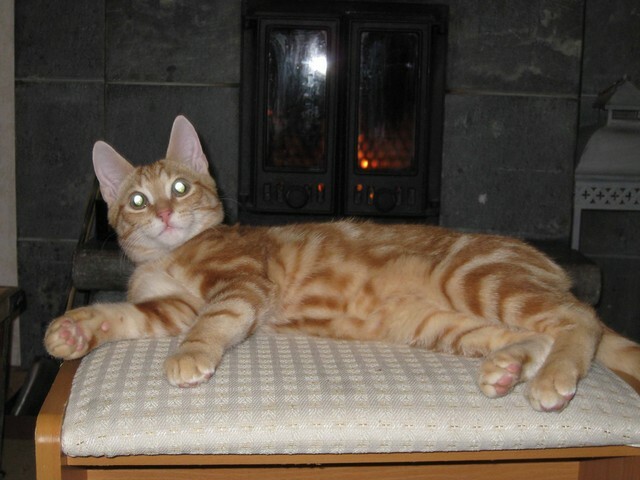 Helmi enjoys going out, when safely watched over, all year round. Her body is in ideal shape and she is very athletic indeed in spite of the kitten’s food often served at home. She is also a top hunter. All little rodents and flying gestures meet their fate in her paws and teeth. Helmi uses expressive and beautiful body language when communicating with her family members. Most often in cat shows the judges say that Helmi is an excellent European. Unfortunately she is not very keen on cat shows herself - maybe she thinks that it can be taken for granted that she is excellent; no need for evaluation in shows. However, she has been nominated several times and and once even Best in Show. Female, born on August 12th 2008, colour blue (EUR a). Breeder Saara Vahtola. Fifi lives in placement in Turku. Fifi is a promising youg female. She has a good size type. She has a sophisticated, curious and gentle character. There is also another young female European shorthair cat in her family. Fifi has received EX1 results in cat shows and she may give birth to a FIN*Lumihelmen litter in the future. Female, born on November the 6th 2007. Colour blue tortie smoke (EUR gs). Breeder Saara Vahtola. Emma lives in FIN*Lumihelmen cattery. Emma's registrated name means FIN*Kassila's Talented Lady, and she has indeed shown that to be true! She has a determined and playful character. Especially Emma enjoys playing with her textile mouse. Emma likes to spend time outdoors together with her daughter Liisi and her mother Helmi, even if she does not like outdoor life as much as the others do. Emma wants to be the queen of her family and that is why she thinks she shall have the last word. Luckily she often sleeps high on the fireplace and in that situation she allows the other cats to make decisions by themselves. She has a good size and type. However, her colouring is her weak side, and, that is why Emma does not participate cat shows. The smoke colour cannot be seen in all body parts while in some others it is very strong (that is why she is registrated as EUR x gs 09; her colouring would also benefit by some more creme. We believe that her "white" actually is smoke - and, indeed all her seven kittens are without white and express show quality. Emma is proud mother of FIN*Kassilan G-litter (our Liisi being one of her kittens). After careful consideration she did decide to establish a family together with GIC FIN*Kassilan Captain Coffee (Pörri, EUR n 23). Emma's determination together with Pörri's energy resulted in no less than seven kittens to which our Talented Lady gave birth phenomenously in less than one hour. Emma's and Pörri's litter was born on the premises of FIN*Lumihelmen cattery on February the 12th 2009. Emma was a very dedicated mother. Hopefully her kittens have inherited Emma's strong breeding biological properties. 6 of her 7 kittens have already received a show degree (Champion/Premier/Int. Champion). Emma has also given birth to FI*Lumihelmen A-kull, sire was Sampo (EUR d 22). Female, born on February the 12th 2009. Colour blue (EUR a). Breeder Saara Vahtola. Liisi lives in FIN*Lumihelmen cattery. Liisi is a promising young European. From very early age she has shown a good European type. Her name has proven to be true: she has a very sweet, friendly and extremely sociable character. Liisi is certainly warmly welcoming us when we come home. She is a talkative, playful and joyful cat. She wants to keep an eye on what we are doing by sitting on our shoulder. If she likes what is going on she keeps tossing eagerly. Liisi has given birth to FI*Lumihelmen litter B, sire was Elekatin Tarmo (EUR a 03). LUMIHELMI "Venla" EUR fs born on March 27th, 2010, owned together with A.-C. Soitamo. Novice, blood group A. Venla has given birth to FI*Lumihelmen litter C, the sire is CH Pinkkitassun Benjamin (EUR d 22). Novice European neutered male, born in Middle-Finland in September 2009. Sampo has got two European litters: FIN*Lumihelmen A litter and Silkkiturkin N litter. Sampo is our first novice European. Sampo's colour is red blotched tabby. Since February the 5th, 2011 Sampo is owned by his placement family in Raisio. Sampo's parents are not known but there were several red kittens in the litter. He has a very loving character and is easy to handle with.